Providing patrol boats to its island neighbors gives Australia influence and stability in its emerging periphery. In an attempt to bolster its influence and help improve regional security, Australia has announced a new Pacific Patrol Boat Program that will provide new patrol boats to twelve Pacific nations. The $1.88 billion program was announced on June 17 by Australia’s foreign and defense ministers. The new vessels will replace those previously donated by Australia that are approaching the end of their service life. The announcement signals Australia’s intention to keep its role as a regional leader through security assistance to its less wealthy island neighbors. 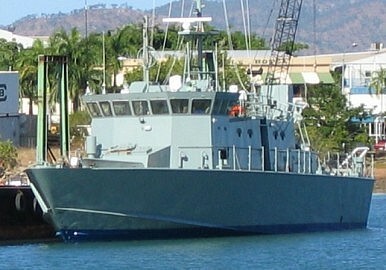 The new all-steel patrol boats will replace the twenty-two 162-ton Pacific-class patrol boats that Australia donated to its neighbors between 1987 and 1997 in the first Pacific Patrol Boat Program. The original impetus was the passage of the 1982 United Nations Convention on the Law of the Sea (UNCLOS). UNCLOS divided formerly international waters mainly through the establishment of Exclusive Economic Zones (EEZ) that extend 200 nautical miles (370 kilometers, or 230 miles) from the shores of each country. This had a particular impact on the small Pacific island states as they suddenly acquired the responsibility to police and regulate activities across vast stretches of water. For example, Kiribati alone has 3,441,810 square kilometers of EEZ, the 13th largest in the world, larger than the total land area of India. The new program will deliver patrol boats to Tonga, the Solomon Islands, Palau, Papua New Guinea, Fiji, Tuvalu, Kiribati, Samoa, Vanuatu, the Federated States of Micronesia, the Republic of the Marshall Islands, and the Cook Islands – the original recipients of the program. In addition, Timor-Leste may become a beneficiary of this new program, raising the total number of recipients to thirteen. These patrol boats have enabled countries with limited fiscal resources to patrol their territorial waters and EEZ. The lightly armed vessels, rarely featuring more than a medium machine gun, are suitable for maritime surveillance and patrol, as well as fisheries protection. The main concern, then as now, is that countries lacking the capability to monitor, police, and enforce the law in their EEZs could be the victim of overfishing by other states’ fishing fleets. The new program has an increased focus on combating transnational crime and, in the case of Timor-Leste, will likely also focus on combating illegal human migration – a particularly sensitive issue for Australia. They are not, however, combat vessels. In fact, the recipients of the previous Pacific Patrol Boat Program’s vessels varyingly operate them through their small defense forces or their police services. It is unlikely that such countries even have the fiscal and technical resources to operate true combat vessels, such as missile boats. Yet such small existing and future craft are constrained in their ability to monitor and police the vast EEZs of their countries. With limited range, these vessels would have to be supplemented by larger, more expensive, and more complex ocean patrol vessels. Still, the existing and future boats provide the island nations a platform that allow their governments to more effectively administer their territorial possessions, respond to humanitarian emergencies (including search and rescue), and have helped to increase the number of trained mariners. Of course, the programs also provide jobs in Australia and boost its influence in the Pacific region. While Australia has long maintained an interest in assisting Pacific island nations in terms of development and governance, including improving security, there is an undoubtedly important diplomat dimension. Australian Defence Minister David Johnston declared that the security and stability of the Pacific Island states are “[a] fundamental strategic interest” to Australia. The diplomatic aspect is not, however, one-sided. Pacific Island states appreciate the assistance. The March 2014 statements of the Federated States of Micronesia’s Secretary of Foreign Affairs, Lorin S. Robert, make this clear. Referring to the Pacific Patrol Boat Program, he remarked: “We cannot overemphasize its importance and its utility not only in ensuring maritime surveillance and law enforcement but also in addressing emergency relief operations, apprehending and preventing sea-borne security threats and delivering needed government services to outlying remote islands in the federation.” A 2011 report estimates the economic loss due to illegal, unreported, and unregulated fishing to the Pacific island states to be around $1.6 billion annually, equivalent to 40 percent of the value of the annual catch. Such figures are even more concerning when the size of the economies in question is taken into account. The Australian government intends to continue funding both the vessels’ construction and life-time sustainment, as well as personnel costs. Australia will also continue training the crews. The government estimates the construction costs to be $559 million and the sustainment and personnel costs over thirty years to be $1.3 billion. The expense is justified by the enhancement of Australia’s leadership and influence, and the improvement in regional security and stability. Moreover, Australia’s efforts signals that it intends to retain a leadership role at a time when China, Japan, France, and the United States are stepping up their involvement in the region. These countries are helping Pacific island states improve their maritime infrastructure, assisting their economies through development aid and, in some cases, providing materiel support for police and military forces. Japan, of course, has already made high-profile donations of patrol vessels to the Philippines and Vietnam. To date, China has not adopted this model of maritime security assistance, instead focusing on providing discounts and soft-loans for African and Asian countries to make maritime security related purchases. Australia’s Pacific Patrol Boat Program may provide a model for other states seeking to increase their influence in the Pacific region, and beyond.